One of the newest additions on the Paladar circuit is “La Galeria” which opened in mid-2011. And thus, La Galería is another welcome addition to the city’s throng of paladares. 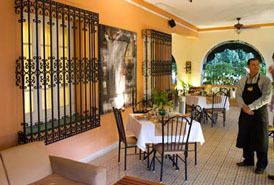 Located on the corner of Calles 19 and 12, it has an outdoor terrace as well as a nice indoor, air-conditioned space. A place of ambient charm, which would be entirely normal in most cities, but somehow appears notable in Havana. The food really is excellent and the menu is varied and well presented. La Galería is as good for garlic prawns as for filet mignon or fresh fish. The staff are experienced and apparently feel neither an intense need to chat nor abandon you when it gets quiet. I like this place.